Quick and Thorough Junk Removal Services For Homes, Yards, and More! If you are in need of professional junk removal services, we at Jake’s Moving and Storage can assist you with quick, thorough, and affordable junk pick up. We serve Washington D.C. and surrounding areas, including the entire states of Virginia and Maryland. We understand how excess possessions can accumulate over the years and pose a problem when one suddenly needs to relocate. Removing all of those unwanted items on your own can be difficult, time-consuming, and frustrating. Our local DC movers can take the stress out of such situations by hauling that piled up junk so that you don’t have to. We make residential moves as pleasant as possible with our fast and friendly junk management services. We also handle general packing and moving, storage, and many other moving-related tasks. Finally, our up front pricing takes the guess work out of your budgeting, and our low prices save you money. What is our residential junk removal service? This service entails removal of all unwanted items from the entirety of your property. It includes yard junk removal, home clean-up services, garage clean out, mattress disposal, furniture disposal, debris hauling, and more. We are a professional moving service and are fully licensed, bonded, and insured. Thus, you need not worry about legal, safety, and insurance issues since we have that all taken care of for you. We can remove excess junk from your old home, from a new home, or from a home you are remodeling. You do not need to carry unwanted junk with you when you relocate, robbing yourself of valuable space in the moving van. All of the items you wish to keep, however, we can assist you in transporting from point A to point B. We are the name in moving and junk elimination that you can trust. Our experienced staff, top-notch tools, and dedication to excellence has earned us the sterling reputation that we have today. What kinds of junk do we handle in our residential junk removal service? 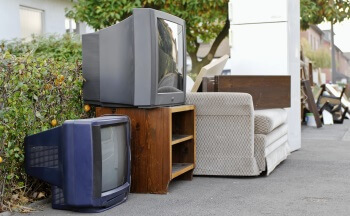 It is no problem to remove heavy, bulky, or odd-shaped junk: we can handle it all. Debris scattered across your yard will not be missed. We check every nook and cranny. When can we be contacted? We are available to take your calls 24/7. We understand that you have moving out and moving in deadlines to meet. We always put ourselves on the customer’s schedule so that junk and debris will not interfere with his or her plans. We serve Washington, D.C., and all of Virginia and Maryland. We can accommodate you with in-state moves or long-distance moves from VA, DC, or MD. Jake’s Moving and Storage offers full junk management, relocation, and storage service to those moving into or out of the above-mentioned areas. Jake’s Moving and Storage is a team of well-trained professionals who are at your service around the clock with top-quality junk and debris removal services. There is no need to hassle yourself with junk clean up: we can quickly make it all disappear from every corner of your property. Don’t hesitate to contact us today for a free estimate. We can offer you a competitive rate with no hidden fees. We can not only take care of any junk problems you may have but also handle all of your moving needs. We look forward to serving you. Residential Junk Removal https://jakesmoving.com/junk-removal/ 3.9/5 based upon 26 reviews.